Looking to deck the halls with Christmas Flowers this festive season? Read on for ideas on how to imbue your home with a feeling of festive floral magic. When you think of Christmas decorations, you probably think of fairy lights, tinsel, mistletoe and, of course, a bobble and angel adorned tree. 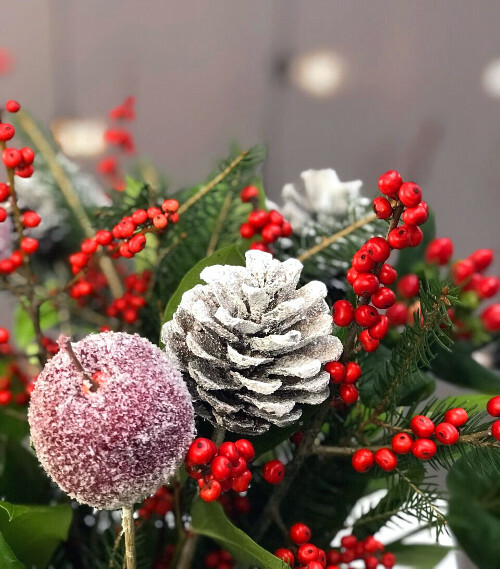 If you want to try out something a bit different this winter holiday season, why not try out some floral arrangements with sparkly silver and glitzy gold or cones, frosted berries and apples, and other whimsical wintry touches. As far as flower types go, there are lots of beautiful winter flowers that can go into the arrangement of a Christmas fresh flower bouquet. Red tends to be popular - think roses, carnations and alstroemeria - but white stems such as lilies, chrysanthemums and white roses can also introduce a touch of wintry magic into a decor scheme. 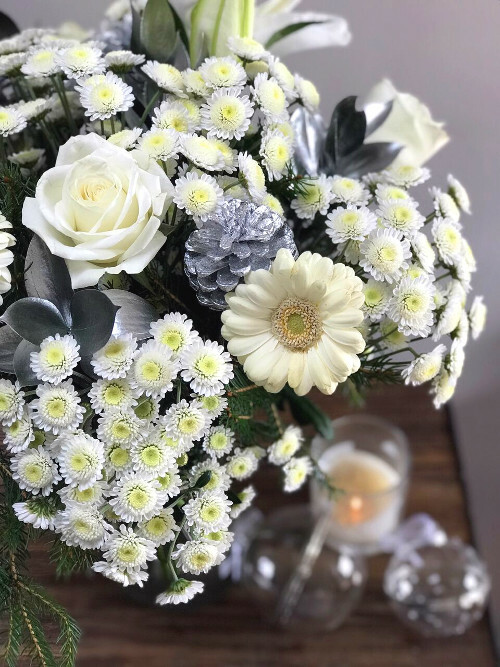 White flowers look especially great when mixed with silver dipped cones, berries or foliage as you can see in our Snow White Christmas Bouquet above. 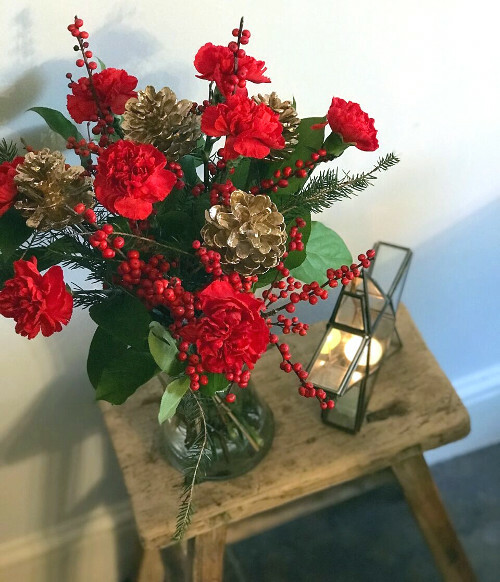 A bouquet of Christmas flowers can be placed in all sorts of different locations around your living room or dining room to create a compelling focal point for guests to admire. Side tables, window sills and coffee tables will all benefit from the presence of a colourful and eye-catching winter flower arrangement. You could even place a Christmas flower bouquet in the centre of your dining table on Christmas Day, although you may need to move it at some point to make way for all the food! Flower bouquets also make great gifts for parties and celebrations over the Christmas and New Year period. 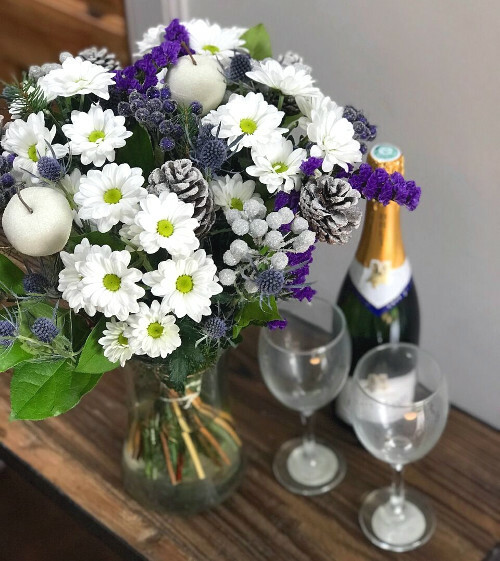 If you've been invited to a Christmas or New Year's party what better gift to bestow upon your host than a fresh bouquet of flowers. Are you planning to add flowers into the mix this year when it comes to your festive decorations?